Right now, savings are lower than they normally would be. That is because Standard Variable rate tariffs have been cut by the first level of the Energy Price Cap which came into effect on 1 January 2019, whereas prices for the cheapest energy deals have been increasing due to rising wholesale energy costs. Therefore, typical annual savings of over £300 have dropped to £148 for a customer already paying by Monthly Direct Debit and £232 for those who still choose to pay quarterly by cheque or debit card. Be careful. If you’re on a Standard Variable tariff this situation will not persist for long. Level 2 of the Energy Price Cap will be set in just a few weeks (February 2019) and will come into effect on 1 April 2019. Ofgem has already warned that the level of the Energy Price Cap is likely to rise and potentially significantly. So, the sooner you get yourself onto a decently priced fixed energy deal, the sooner you’ll pick up those savings. In the meantime, here is the graph and the analysis. 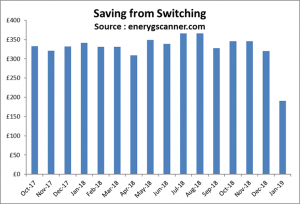 Based on our analysis (explained below) the typical annual saving for a domestic energy consumer on a Standard Variable Rate tariff, with average energy usage, has varied from £190 to £366 over the past 12 months with an average annual saving of £326. Customers already paying by direct debit will see lower savings (approximately £40 less as they are already benefitting from cheaper pricing by paying in this way). Conversely, those paying quarterly by cheque or debit card can pick up £40 over the average as they are heavily penalised for paying in this way. Current savings are at the absolute low end of the range because of the distortion created by the Energy Price Cap. The next level of the cap is expected to be materially higher and is expected to push savings much closer to historic levels. Analysis is based on Standard electricity meters only (does not include Economy 7 or night time usage meters). If you have an Economy 7 meter please use our comparison service to get a customised quote. Bills are calculated for each energy region and then averaged. Average bills are calculated for the 2 main payment methods – monthly direct debit and quarterly by cheque or debit card.